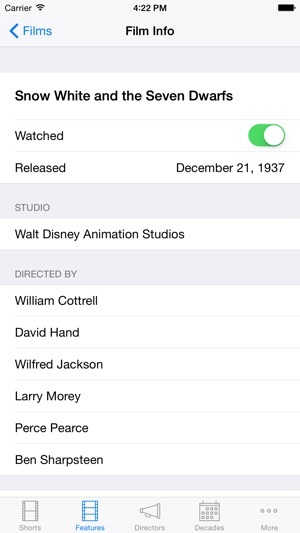 WALT is the Watched Animation List Tracker. 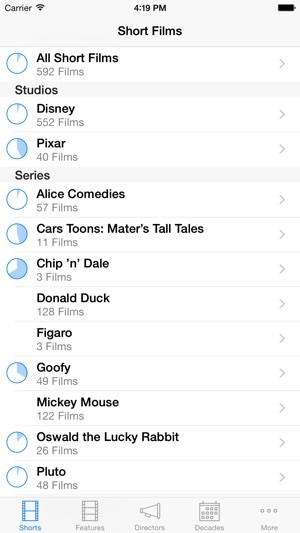 Now, fans of Disney and Pixar animation have an app to track the animated films they have watched. Inspired by the logbooks kept by birdwatchers, with WALT, you can track over 650 animated short films and feature films. You can view films by studio, director, decade, and cartoon series. Search from any list to quickly find the film, director or series you are looking for. Track which films you have viewed with a simple checkbox. View a detail page for each film showing information such as release date, studio, and directors. Let your friends know what you’ve watched in a variety of ways including Twitter and Facebook. Your progress in each category is summarized automatically, making it easy to see at a glance how close you are to watching them all. This app is not affiliated with the Walt Disney Company. Great app, easy to use and a clean look to it. Some movies, such as The Goofy Movies and Song of the South, are missing. The John Henry short film is also missing. 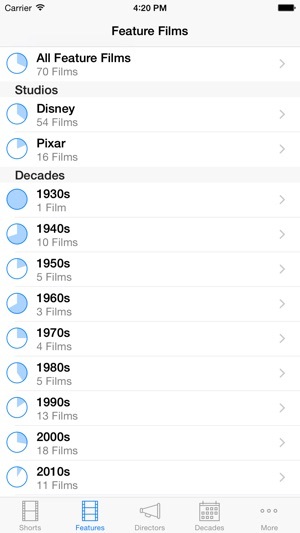 Other than these missing films, this app is fantastic and I definitely recommend. Thank you for your review. I'm very glad you are enjoying WALT! You should find that the short film 'John Henry' is now added. 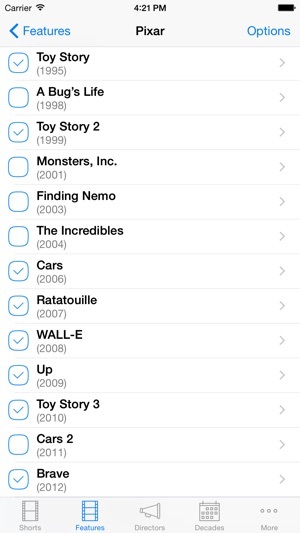 The app includes every full-length Disney animated film in the canonical Disney Animation Studios list. Films like 'Song of the South', 'So Dear To My Heart', and 'Mary Poppins' were produced by Walt Disney Productions and include animation as well as live action, but are not on the official list of animated features. Films like 'A Goofy Movie' and 'The Tigger Movie' were produced by Disneytoon Studios (originally named Disney MovieToons), a separate animation studio also owned by Disney. One intent of the app has been to focus on theatrically released films, and over 70% of Disneytoon Studios movies were direct-to-video. I really appreciate your feedback. For now, the app will continue on its mission of tracking Pixar and Disney Animation Studios animated films, but your feedback gives me possible directions for the future. Thanks again! 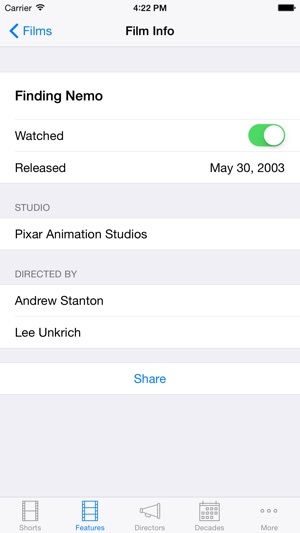 Awesome app for tracking Disney movies and shorts. Simple and clean design without a bunch of useless over-the-top features. Overall a cute and fun app to have on hand was highly interested when I saw it on pixartalk, although there are a few missing movies like "A Goofy Movie" and "An Extremely Goofy Movie". Also I know its a lot of work, but a television secition in the future would be something I might look forward to.